A hit, a hit, a palpable hit! The Bard’s most popular, and arguably best-written, play springs to life w/ a fresh, modern adaptation by the RSC. (It is now available on DVD in the US.) This one is a must-see for all Shakespeare fans! 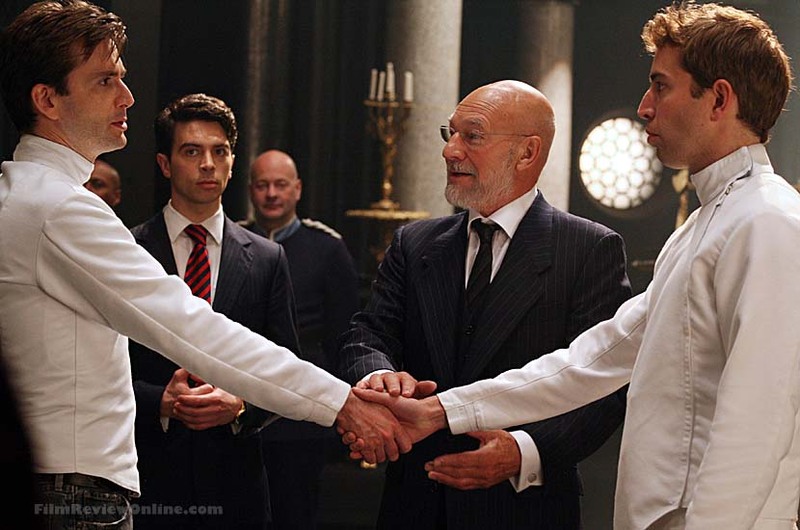 Tall, wiry Scotsman David Tennant (Dr. Who) tackles the title role and theater veteran Patrick Stewart (Star Trek: The Next Generation) portrays the ghost of Hamlet’s departed father and Claudius (Hamlet’s “uncle-father”). They played these roles on stage, so are well prepared for the screen version. 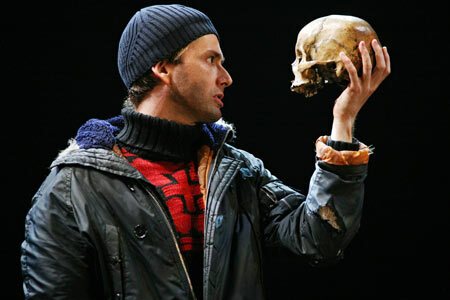 Hamlet (sometimes in a single scene) must be able to convey much- anger, intelligence, melancholy, and wit. 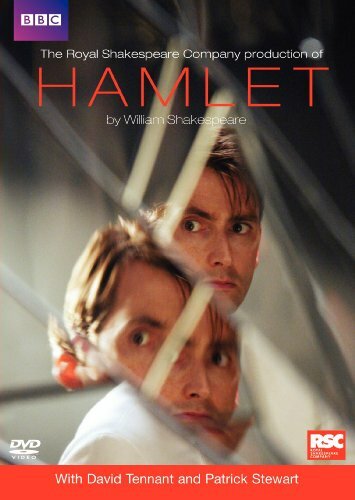 Tennant creates a Hamlet for our time; he shows us Hamlet’s isolation, emotional torment, confusion, and self-awareness. 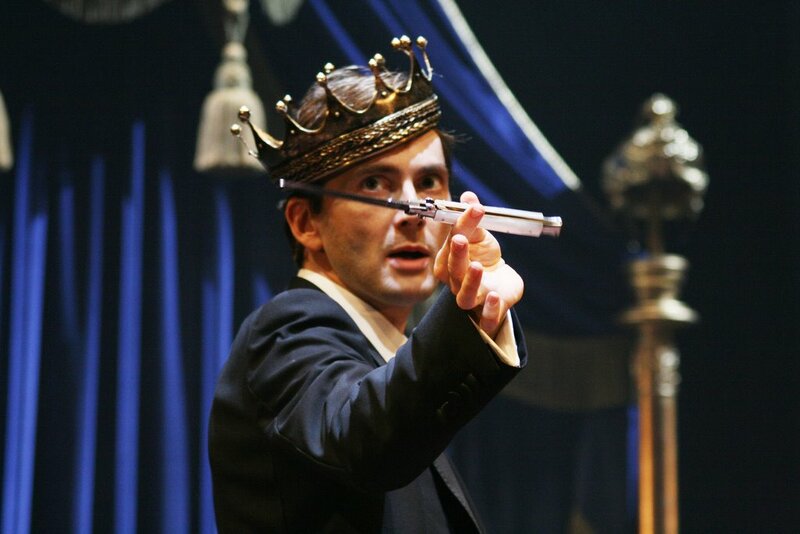 I feel Tennant does a GREAT job in showing us Hamlet’s muti-faceted personality. Unlike in the theater, here we get close-ups of the actors. Hamlet can connect more deeply with the audience (a glance into the camera, a side joke). The use of a pistol in a pivotal scene rendered the scene less dramatic in my opinion. The dark main set didn’t appeal to me, but the use of the large broken mirror was a good directorial choice. The use of surveillance cameras was interesting; Hamlet is always under watch. On to the supporting cast… Claudius is played with grace and subtlety by Stewart; often villains pretend to be just like ordinary people. I thought he was VERY effective as the ghost as well. Polonius and Gertrude did a fine job, as did Horatio (who had a sense of gravitas and a marvelous speaking voice).